We think that these three stocks in the energy sector are great buys now. Energy stocks had a tough year in 2018. Not only did the S&P Energy Sector Select Index drop 20% last year, but it also came precariously close to the lows of 2016 when oil was less than $30 per barrel. The volatility of this industry has no doubt kept many investors away from it. For those with a longer-term outlook, though, this could be a great time to go searching for deals. 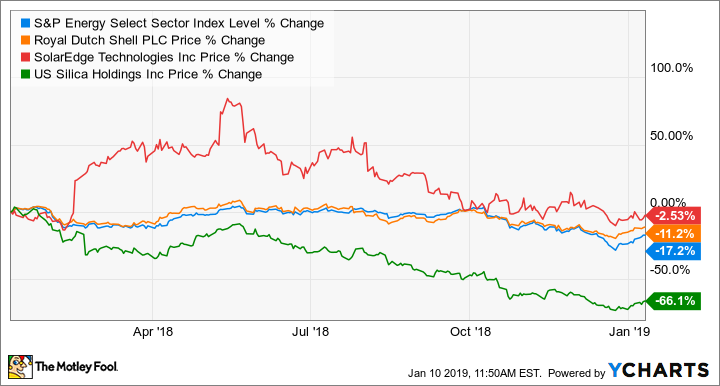 So we asked three of our Motley Fool contributors to each highlight a stock in the energy sector they see as a great bargain worth buying in January. Here's why they picked integrated oil and gas giant Royal Dutch Shell (NYSE:RDS-A) (NYSE:RDS-B), solar energy component manufacturer SolarEdge Technologies (NASDAQ:SEDG), and fracking sand supplier U.S. Silica Holdings (NYSE:SLCA). John Bromels (Royal Dutch Shell): Is there ever a bad time to pick up shares of top oil major Royal Dutch Shell? Well, you could argue that folks who bought in at the top of the oil market in 2014 might not be happy, since the company's shares haven't gotten back to that lofty price of about $75 per share. But if you factor dividends into the mix, Shell's total return has been positive over the last five years. And, of course, when share prices are down, dividend yields go up, as is the case with Shell's current yield of 6.2%. But Shell has clearly learned some lessons from that big oil price slump: Thanks to cost-cutting measures and some savvy investments -- not to mention oil prices that had finally gotten back above $65 per barrel -- Shell's Q3 2018 was an earnings bonanza. Not only did the company generate $5.8 billion in net income, it managed to churn out $12.1 billion in cash. That's more than it has generated in a single quarter since Q2 2008. Of course, in 2008, oil prices were above $100 per barrel! But Q4 may not be quite so rosy for Shell, thanks to a prolonged oil price slide of about 30%. Shell's share price followed suit, dropping 9.9% over the last three months. However, oil prices have stopped sliding and have even rebounded a bit in the past few weeks. And Shell's cost-cutting during the oil price slump means it's not as dependent on high oil prices as it was only a few years ago. The company's current share price and high yield, coupled with oil prices that have (at least for the moment) stopped sliding, make now an excellent time to scoop up some shares of Shell. Rich Smith (SolarEdge Technologies): The stock market took a bit of a tumble toward the end of last year. That's not a huge secret, but here's something you may not have noticed: Whereas S&P 500 stocks have largely recouped their losses from December, one energy stock in particular has not -- and as a result, it's almost unbelievably cheap today: SolarEdge. The Israeli maker of solar power inverters, which are used to convert direct current generated by solar panels into alternating current to feed your appliances, lost 12% of its value between the first day of December and the last -- and remains within pennies of that low point today. And yet, Goldman Sachs recently predicted an imminent "U shaped recovery" in solar stocks -- a fact that SolarEdge investors have been slow to acknowledge. Priced at just 12.5 times trailing earnings, SolarEdge looks obviously cheap on the surface. But with $150 million in free cash flow -- 11% more than reported earnings -- the stock is arguably even cheaper than it looks valued on P/E alone. Between its strong free cash flow and its projected 22% growth rate, I'd ordinarily expect a stock like SolarEdge to be trading for $3.3 billion or thereabouts. Instead, the company is valued at just $1.6 billion -- or less than $1.3 billion net of cash. Representing more than a 50% discount to intrinsic value, investors should seriously consider giving this stock a look in January -- before it has a chance to go back up. Check out the latest SolarEdge Technologies earnings call transcript. Tyler Crowe (U.S. Silica Holdings): Fracking sand was supposed to be the industry to buy when shale drilling started taking hold in North America. It was a critical component for fracking and producers have found that more sand in their fluid mix yields better results. From 2007 to 2017, the oil and gas industry's sand consumption grew 12-fold, according to IHS Markit Insights. That kind of astronomical growth should have made frack sand suppliers into industry giants. That hasn't been the case, though. While growth has been astronomical, it hasn't been a linear path to get there. The wild swings in demand over the past few years have left sand suppliers either scrambling to build new facilities or shuttering plants to cut costs. What's more, the barriers to entry for opening a sand mine aren't that large. Compared with the capital commitments for other mining operations, sand is one of the cheapest. This lower-barrier-to-entry business coupled with oscillating demand has made investing in this business incredibly challenging. One business in this incredibly hard business stands out, though: U.S. Silica Holdings. Even though it is one of the largest players in the business, the reasons this business is well positioned to succeed has little to do with its scale. The three things that should matter to investors most is its more diverse end markets, long-term supply contracts, and last-mile logistics services. U.S. Silica's industrial and specialty products business has been a steady performer for years that has helped to offset weaker periods for the frack sand segment, and it recently expanded this business. Management has also signed several long-term takeaway contracts with minimum volume commitments and fixed prices. Having these contracts in place will help to offset some of the volatility. Finally, its last-mile logistics services is a way to significantly boost margins per ton sold and makes it easier for customers. U.S. Silica is the only company in this business with all three of these traits, and it shows in the company's earnings results. Today, shares trade for 7.7 times earnings. While investors should be prepared for a wild ride with this stock, today's stock price looks like an attractive time to start a position in U.S. Silica. Check out the latest U.S. Silica earnings call transcript.